LONDON (Reuters) - World shares slumped to near a four-month low on Tuesday as signs of a slowdown in the U.S. economy aggravated the anxiety caused by a sell-off in emerging markets. A report showing U.S. factory activity was weaker than expected had caused both the dollar and global equities to fall on Monday. 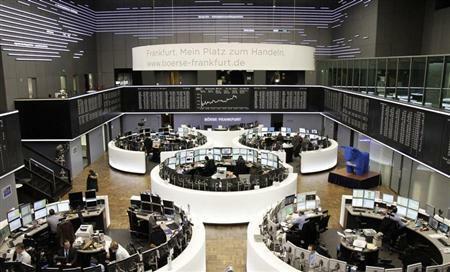 European investors remained anxious on Tuesday after another session of sustained selling in Asia. Futures prices pointed to a 0.3 percent rebound for Wall Street later, but a mid-morning attempt at a stabilisation failed in Europe. The benchmark FTSEurofirst index fell 0.4 percent and headed for a third day of declines. And Europe looked almost rosy compared with Asia. Tokyo's Nikkei plunged 4 percent in its worst day since June, cementing its position as the worst performer in developed markets in 2014. MSCI's emerging-market index dropped 1.4 percent, putting its losses since late October at almost 12 percent. "It does look as if developed-market equities are playing catchup with emerging markets," Societe Generale strategist Kit Juckes said. "The dollar has somewhat run out of steam, and I suspect the focus today may well be on yen strength as well as how much further the equity market falls can go." With a flight to safety going on, German government bonds, considered to be one of Europe's most secure investments, saw prices hit a 6-month high. Debt from elsewhere in the region lost ground. The Australian dollar jumped after its central bank appeared to shut the door on further rate cuts. But the main focus of the currency market remained the U.S. dollar's contest with the yen. Two factors were at play. U.S. bond yields fell after the weak data hit the dollar, and the Nikkei's plunge pushed up the yen. The Nikkei and yen often see-saw: as one goes up, the other goes down. The U.S. dollar appeared to be recovering, though. It was last up 0.3 percent at 101.27 yen, after hitting its lowest level since November on Monday at 100.77. Another round of strong UK construction data also left sterling looking spritely at $1.6340. Talk of policy easing by the ECB at its monthly meeting on Thursday held the euro back at $1.3509. The stock market sell-off left MSCI's 45-country, all-world index at its lowest since October and saw the VIX, the market's fear seismograph, jump to its highest since June. It also boosted the safe-haven appeal of gold. Spot gold was steady on at $1,258.84 an ounce, after gaining 1.1 percent on Monday. But three-month copper on the London Metal Exchange, a metal highly attuned to global growth, edged down to $7,020. That put it on track for its 10th straight losing session and its longest run of falls in 37 years. The Nikkei's 4 percent dive cemented its position as 2014's worst-performing major market. It has shed 14 percent of last year's 50 percent boom. By comparison, the U.S. benchmark S&P 500 is down 5.8 percent. The FTSEurofirst 300 fell 3.3 percent. "With the main European indices down around 7 percent (since peaks), chatter on trading desk is about whether we are in for a '10 percent' correction," Jonathan Sudaria, a dealer at Capital Spreads in London, said in emailed comments. "The bears have a seemingly easy target within reach and the remaining bulls will want to get out of the way." Among other perceived safe assets, the yield on benchmark 10-year U.S. Treasury notes stood at 2.602 as U.S. trading loomed. It fell as low as 2.582 percent on Monday, its lowest since November 1. The dollar's overnight weakness also provided some relief to emerging-market currencies. Turkey's lira, Russia's rouble, Hungary's forint and the South African rand all edged higher. "Experienced emerging market investors would be looking at this sell down with great interest, looking to pick up quality names on the dip, but they are still in the minority for now," said Erwin Sanft, Standard Chartered's Hong Kong-based China equity strategist.